With the extremely low price and slim profile of this oven, this is one of those deals that would be extremely hard to pass up. 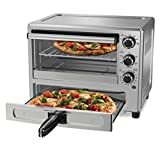 If you have been considering adding a toaster oven to your kitchen, but aren’t totally sold on if you actually need one or not, this oven would be a great way to find out. Oster is one of the biggest and most reliable companies in kitchen appliances and kitchenware, and has been for years. Overall, this oven is a really simple model and doesn’t give you a lot of customization with what or how you are cooking something, but for the price this spunky little toaster oven is hard to beat. Is cooking and preparing food one of the last things that you want to be worried about when you get home from a long day at work? The last things that we want to do when we get home from a long day include preparing food, firing up the oven, and spending 1-2 hours in the kitchen to make dinner at night. Making a home-cooked meal is wonderful, but the reality is that we don’t always have the time or patience to make one. One of the greatest benefits to getting yourself a quality toaster oven is the amount of time that you will save in the kitchen at home. Microwaves are nice and easy, but don’t quite give your food that same homemade meal flavor that the oven does. The only problem is the oven can take to long to use. The toaster oven is the perfect in between. You can use it to quickly prepare meals that have that homey feel to them. Even though a toaster oven that’s this reliable and inexpensive could be a no-brainer decision, it’s always good to take a closer look at what you are going to get. 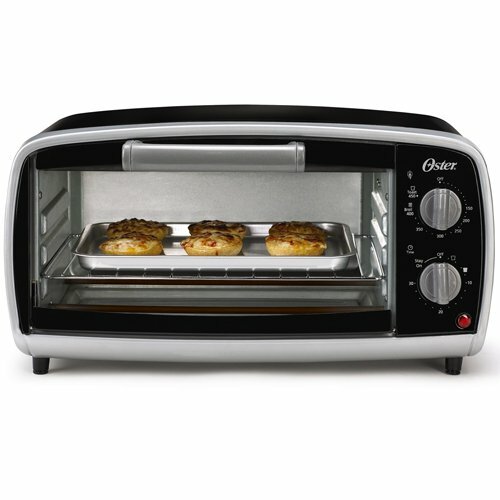 The Oster TSSTTVVG01 is one of our best toaster ovens under $100. Now that you have great, unbiased overview of some of the pros and cons of the Oster TSSTTVVG01, let’s dive into some of the highlighted features of this oven and what it can offer your kitchen. 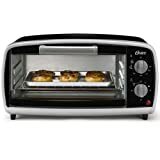 This toaster oven offers all of the basic functions that you need to get started with cooking. The control knob lets you choose functions for toasting, baking, or broiling food. 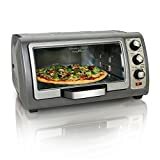 Whether you want to bake a tray of cookies or muffins, make toast for your on-the-go breakfast, cook a pizza for dinner, or broil a pork loin, you can do it all in this compact toaster oven. Relate: What Can You Cook in a Toaster Oven? What good would any oven be if you only had presets, but couldn’t select the temperature? This toaster oven allows you to select the temperature up to 450 degrees fahrenheit, so your cooking possibilities are just about endless. The built in timer on this toaster oven is another added bonus. Some models of toaster ovens will allow you to pick certain settings on the oven, but you will have to use a separate timer so that you don’t overcook or burn your food. The built in timer cooks your food for the time that you choose with the timer control knob. One of the most important things to look for in a good toaster oven is that it is easy to clean. If this is an appliance that you are planning on using daily, you are going to need to clean your oven regularly. Thankfully, it is really easy to remove and empty the crumb tray on this oven, remove the racks, and clean them and the inside of the toaster oven. For one person, this oven offers plenty of space. In changing the rack positions you have enough space to bake a tray of muffins, a personal pizza, or roast a chicken. This oven is for anyone who is looking for a simpler, faster way to prepare food at home. 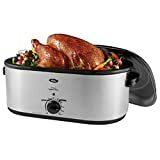 If you don’t have the time or patience to spend hours cooking every night and don’t want to shell out $100 plus on a high-tech toaster oven, this would be a great purchase for you. This toaster oven would be best for households of one to two people. Any larger than that and you should probably be looking for a bigger toaster oven.